Bliss to you. Is me, Trixie Koontz, who was dog, is dog, always will be dog. Dog is very best thing to be. If you are dog, reading this, you know is true. If you are human reader – trust me. I am dog, and dog can’t lie. 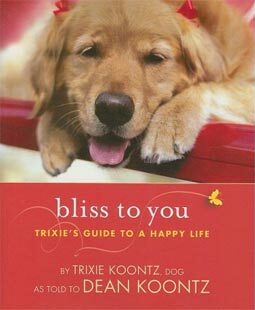 I, Trixie, who am dog, wrote the other two books. LIFE IS GOOD: LESSONS IN JOYFUL LIVING and CHRISTMAS IS GOOD. Never thought would write third. Is in Koontz family blood – insane need to write. The other night, wanted to howl at the moon. May need counseling. Anyway, this book is about bliss – what it is and how you find it. Humans all want bliss but end up instead in jail and traffic court, or rehab, or broke in Las Vegas, or lost at sea, or gutting halibut in stinking hold of Alaskan fishing trawler and wondering – How did I get here? All dogs know the secret of how to achieve bliss. And here on the Other Side, in the company of angels who toss tennis balls for us and give us belly rubs, I have learned even more about the subject. But to know more, must buy book. Royalties go to Canine Companions for Independence, so is good deal.